Sample training assessment forms listed below have various categories such as on-going training assessment, pre and post training assessment and much more. They are tailor-made for assessing a candidate in the best possible way and the list of the questionnaire are going to bring out the best out of the candidate. 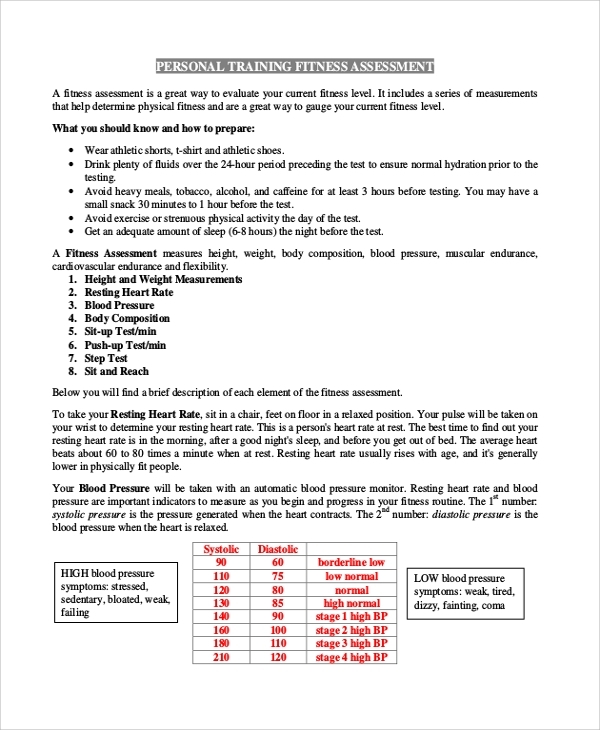 It is the best process to assess employees during and post their training to understand their strong points and allot them accordingly.You can also see Sample Physical Assessment Forms. 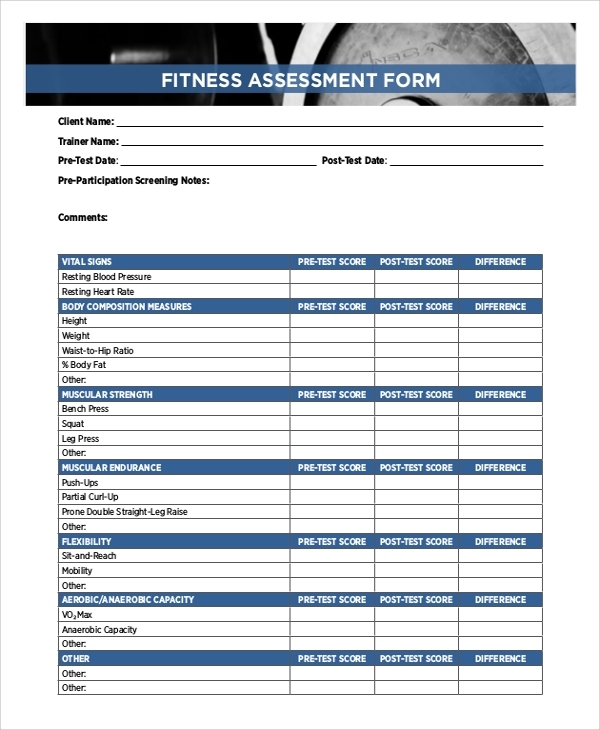 This is a perfect post-training assessment form to judge the candidate according to some preset parameters to understand how the training has gone for him or her. Such form has all the provisions assess candidates from all perspective and certify them for further improvement or promote them to the next level. It also helps the higher authority to understand a candidate better and allow them to services based on their strong points. This is a complete form for collection of personal and professional information from candidates through a manual interview before training session begins. It has a provision such as personal data, contact information, job description, previous training, language proficiencies, specializations, communication skills and areas of interest. These are vital records for future reference. 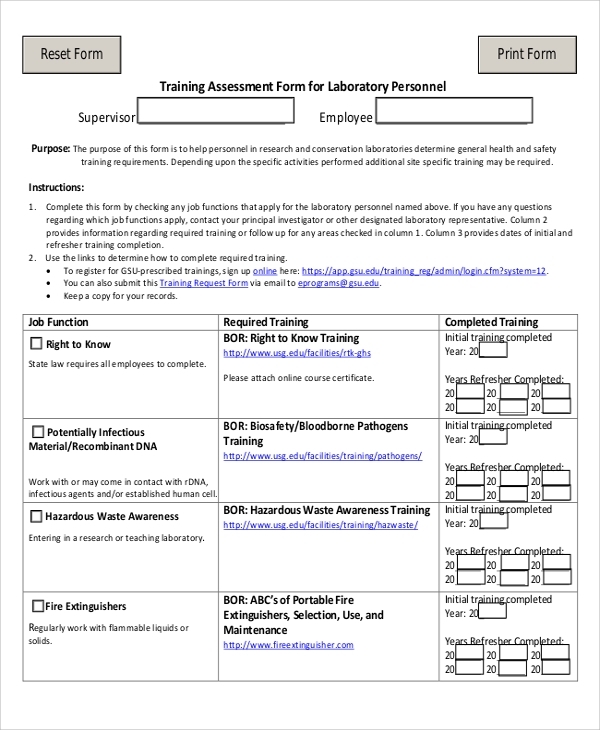 This is an all-in-one training assessment form for employees during and after the training. This is in the form of a booklet. It assesses employee’s fundamental concepts and understanding of modules. It tests their quantitative and qualitative knowledge, reasons and mental state. It takes a general survey of the lifestyle of the employees during the training. It has provision for testing technical knowledge and approaches in practice problems. 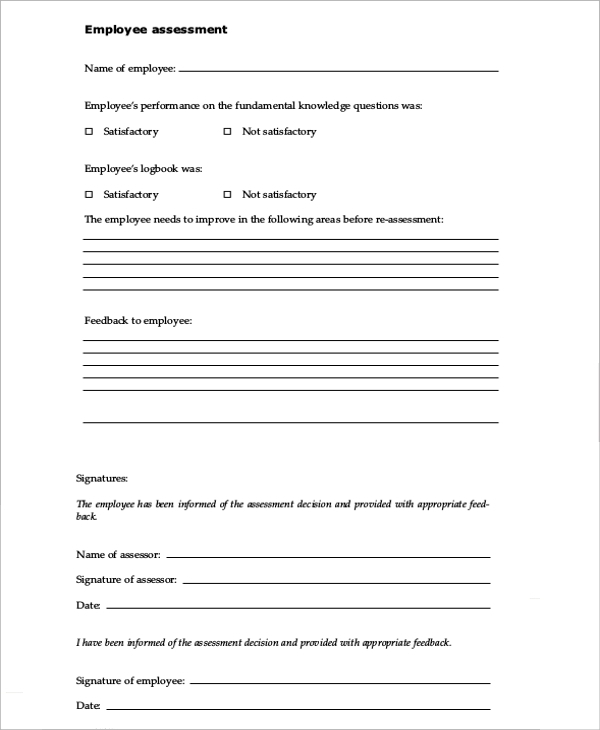 These training assessment forms are useful for companies and management people to collect records such as personal data and technical skills and areas of interest before the training begins. Midway through the training, a company can judge the trainee to understand how the training is going and how the trainees are receiving it. These forms are also useful to assess a trainee after the training gets over to understand his or her strength and weakness and technical proficiencies so that company can put them in the field where they can excel and provide better work output. The targeted audiences for such evaluation forms are the would-be trainees, trainees, and would-be employees. Such forms are for pre-assessment, post assessment and assessment during the training. 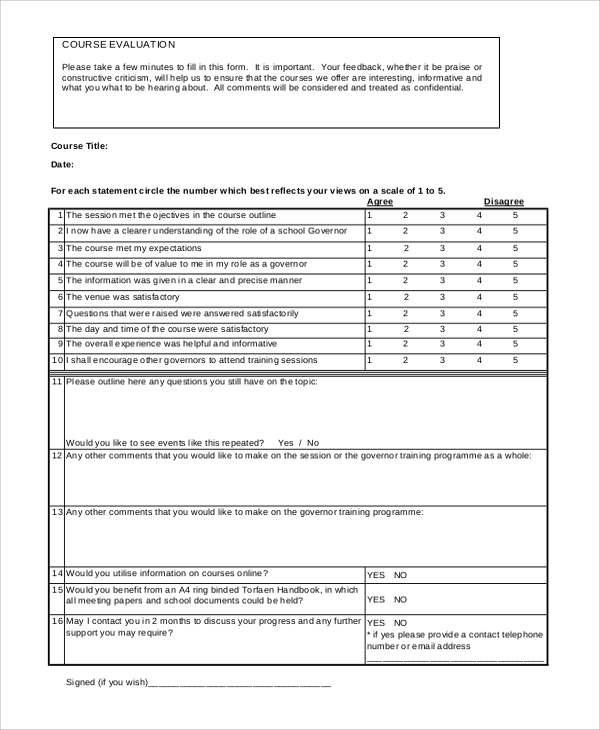 The targeted audiences are also the higher management who can review the forms to understand the best field in which the trainees must be sent to get the best out of their strengths.You can also see Sample Nursing Assessment Forms. Trainee assessment forms help in understanding a candidate better and evaluate his or her strength and weakness and how they are doing during the test. Pre-training information for vital for records, during the training assessment, helps in recommending the candidate in an improvement of weaknesses and improving upon the strengths for a better future position. Post-training assessment helps in allotting a candidate in the right position for better work efficiency and output. Any training needs analysis form to understand and evaluate the strong and weak points of a candidate pre, post and during the training. Such understanding and evaluations are immensely important to allow him in the right positions to get the best out of him effortlessly. 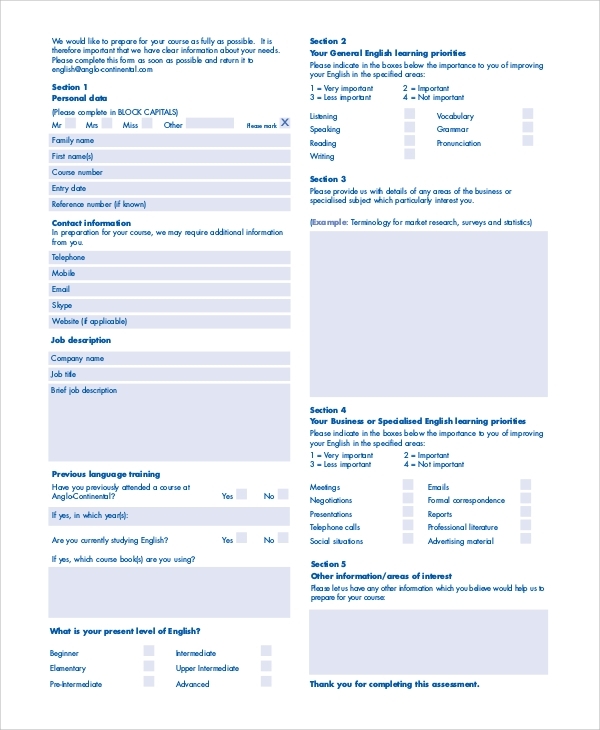 The training assessment forms can also be stored for future reference or for recommending a trainee to retake the training.You can also see Sample Interview Assessment Forms.